On our recent trip across the north of Australia we were lucky enough to encounter several Sarus Cranes-Grus antigone, which are incredibly tall and elegant birds. 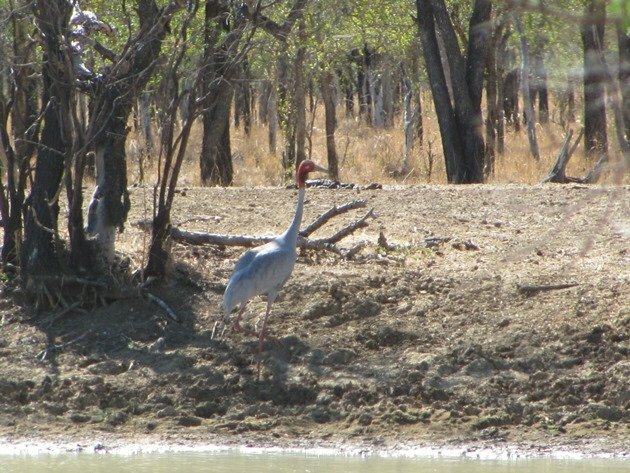 Our first encounter with Sarus Cranes was shortly after we left Normanton heading towards Karumba and it was a family group of two adults and one juvenile near the Corduroy Creek crossing. We immediately turned around to observe them feeding and they were clearly different to the Brolga that we are so familiar with around Broome. 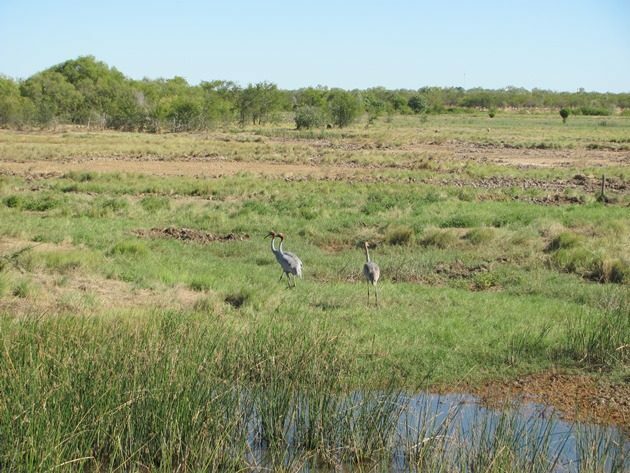 Brolga are currently increasing in numbers around Broome now the land is starting to dry out and they have clearly bred well this year and their numbers are in the hundreds. A flock of Brolga in the past week exceeded five hundred individuals and we can expect the numbers to continue to increase. 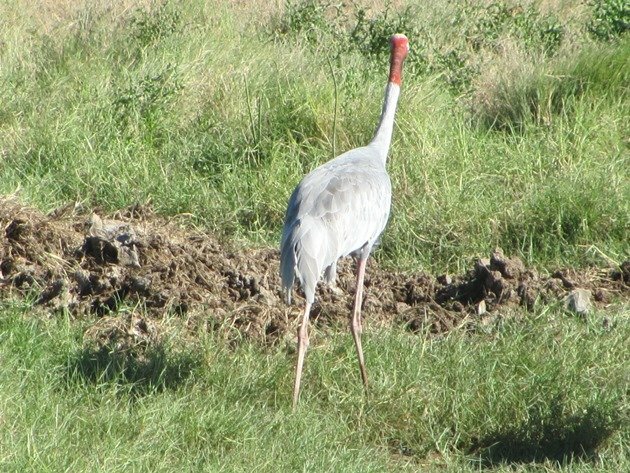 Sarus Cranes are a slightly taller species than the Brolga and also appear to be a paler grey. 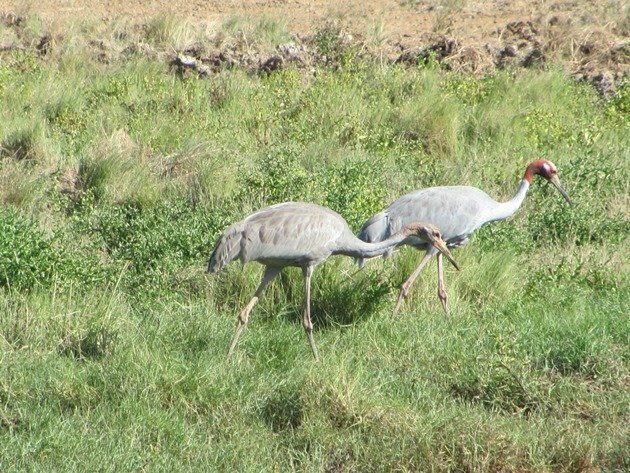 The main distinctive feature you immediately notice on the Sarus Crane is the red colouring on their heads that is much larger than that of the Brolga and also the lack of the dewlap under the throat. Standing at over 150cm the Sarus Cranes are an impressive bird and the wingspan is upwards of 250cm and is the tallest flying bird in the world. 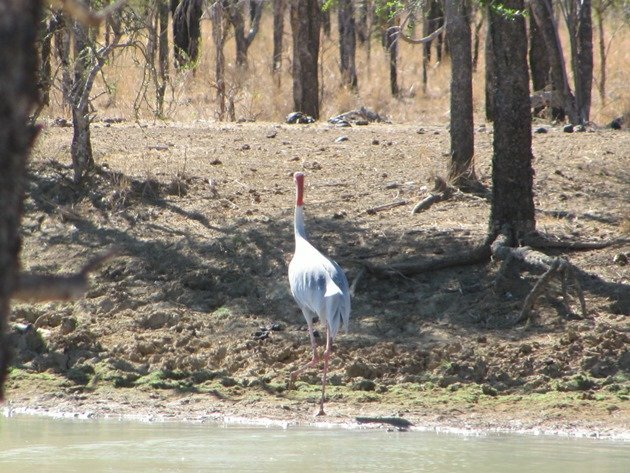 Rather than the blackish legs of the Brolga the Sarus Crane has pinkish colour legs. 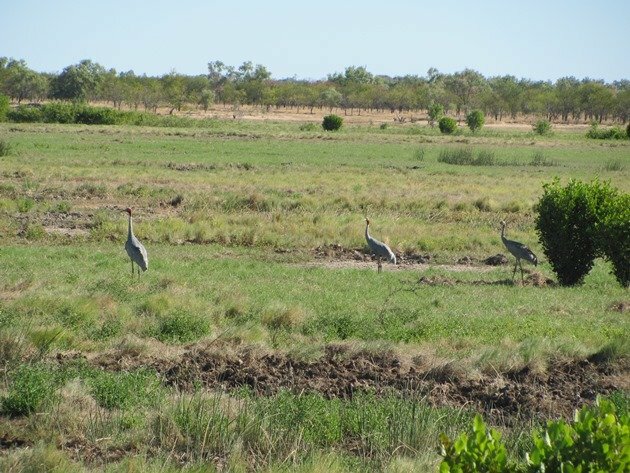 Both species inhabit the same sort of environment and every flock of tall cranes that we encountered during our drive to Karumba consisted of both species. The birds were feeding in the tall dry grass and also close to water. 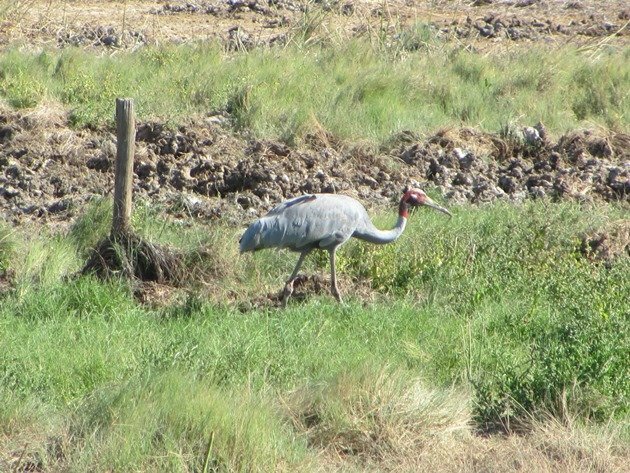 The Sarus Cranes were easily observed from the highway and although the field guides for Australia indicated we were in the right location for observing Sarus Cranes we had not been certain that we would encounter any or least of all so many! The family group of Sarus Cranes moved slowly through the grassy swamp area searching for food and they spent the whole day in the area around Corduroy Creek crossing. We were able to spend more time observing them later in the day and although the juvenile Sarus Crane is almost the same height as its parent it does not have any of the red colouring on the head area as yet. Another encounter we had with Sarus Cranes when we were heading back from Karumba to Normanton later in the day was a pair walking in a dam right up to their breast feathers. It helped to clean their legs and put emphasis on the pink colouring! We had never observed Sarus Cranes until that day in July and they are proudly on the 2017 year list! 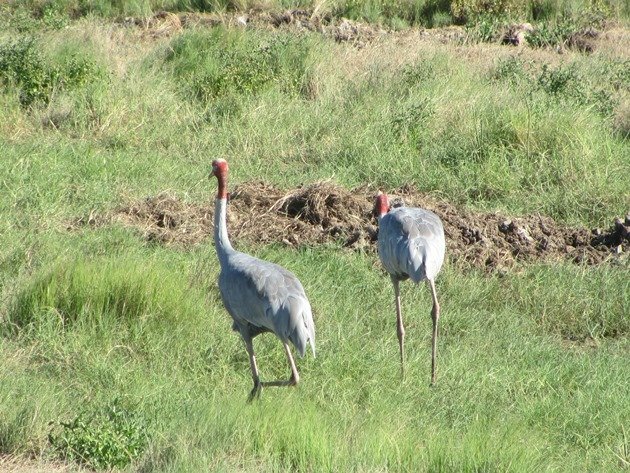 There is a lot of useful information regarding the differences and similarities between Brolga and Sarus Cranes on this website. The Australian Government removed them from the migratory species list in June 2015. Cranes are always impressive. Congrats on the new addition to the list! How many birds do we see?